Go to any gym and you'll see the most popular cardio machines are usually the treadmill and the elliptical trainer. Both are excellent for cardio workouts and burning calories, but many people gravitate towards treadmills just because they've been around a lot longer than elliptical trainers. The treadmill mimics your natural walking and running, while the elliptical may feel a little more foreign to your body. But which one is the best choice for your cardio workout? An elliptical trainer combines arm and leg motion. A flywheel provides adjustable tension. It's a popular choice for home use as well as at the gym. No-Impact Workout: Your feet never leave the pedals, so your bone, joints, and ligaments don't have the same stresses as with running. This is a big benefit if you have joint problems or pain. A Total Body Workout: By using the arm handles as well as the pedals, you work your upper body and core, not just your lower body. A Natural Movement: The movement of the elliptical is kind of like riding a bike standing up, so it feels like a natural way the body moves. It Feels Easier: Some studies have shown that you can burn the same number of calories with an elliptical as you can with a treadmill, only it may actually feel easier. It may be because the lack of impact gives you the impression that you're putting in less effort. Variety: Not only can you add resistance to change your workouts, you can also go backward—something you can't easily (or safely) do on a treadmill. Cost: You can buy a good-quality elliptical trainer for far less than a good-quality treadmill. No-Impact Workout: While this may be a pro for people with joint problems, you do need some impact in your daily life to keep your bones strong, something the elliptical doesn't offer. Numb Feet: Because you don't have to pick up your feet, they can get numb the longer you work out. You may have to shift your feet and move your toes around to get your circulation going. 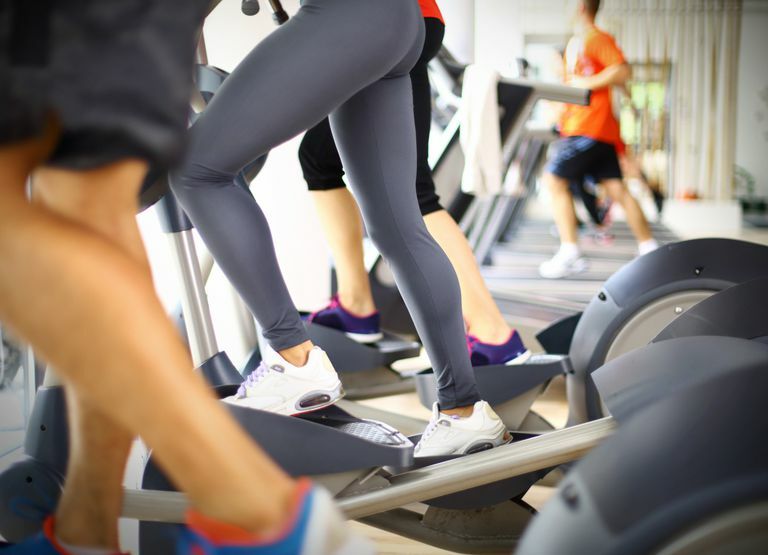 Burning Legs: When you first use an elliptical, you will be using your quadriceps in a new way. This can give you that burning sensation you feel when using a muscle to its maximum. This should subside after several sessions as your muscles respond to this new challenge. A motorized treadmill uses a motor to move the belt, allowing you to walk or run in place. Impact Workout: You can make this a low-impact workout by walking or a high-impact workout by running, both of which help build strong bones and may help you burn more calories during your workout. Variety: You can walk or run on the treadmill at varying speeds and you can change up the incline as well for different types of workouts. Better for Runners: The elliptical is great for cross-training but, if you're a runner, the treadmill provides sport-specific training for races or charity runs. Easy to Use: There is not much of a learning curve for treadmill walking, other than getting used to the moving belt. Doesn't Always Translate to Outdoor Running or Walking: Because the treadmill belt moves, it actually helps pull your legs back, reducing some of the efforts you would normally feel when running outside. There's no wind resistance or terrain change, and most treadmills lack a downhill "decline" function. Moving from indoors to outdoors may be a big surprise for your body. Boring: It can be monotonous running or walking to nowhere on a treadmill and you may need tactics to prevent boredom. Risk of Injury: The belt moves and there's always a risk of slipping and falling. Cost: You get what you pay for when it comes to treadmills. A treadmill that is suitable for running rather than walking needs a powerful motor and sturdy frame. This will cost over $1,500. Inexpensive treadmills for home use often will not work well for running. The bottom line is, either machine is great. If you're working out at the gym, there's no reason you can't use both machines—either on different days or even in the same workout. If you're looking for something for your home gym, the best advice is to go and use different machines multiple times to find the one that works best for you. Brown GA, Cook CM, Krueger RD, Heelan KA. Comparison of Energy Expenditure on a Treadmill vs. an Elliptical Device at a Self-Selected Exercise Intensity. Journal of Strength and Conditioning Research. 2010;24(6):1643-1649. doi:10.1519/jsc.0b013e3181cb2854.